David Jegen is a Partner with F Prime Capital, the venture capital firm affiliated with Fidelity Investments. 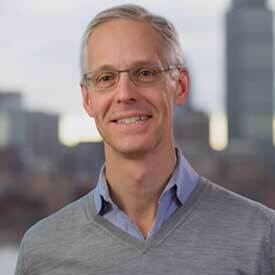 He has led investments in Cloudant (acquired by IBM), Kensho, FutureAdvisor (acquired by BlackRock), Flywire, Toast, Quovo, EVEN Financial and Axoni. David was a co-founder of Sensoria, Inc. and VP of Product at Into Networks, a Venrock-backed company acquired by Softricity, now part of Microsoft. Most recently, David was a senior executive with Cisco Systems. He held early positions with J.P. Morgan & Co. and The Boston Consulting Group. In 2014 David co-founded FinTech Sandbox, a nonprofit that serves entrepreneurs by aggregating data for free, backed by leading institutions like ThomsonReuters, FactSet, Yodlee, Amazon, S&PCapitalIQ and Fidelity Investments.